Welcome to this site ladyhunter. It will nice to maybe have a woman's point of view on here. I didn't know they were going to do it but I got my first taste of a southern hog hunt with dogs earlier this month. 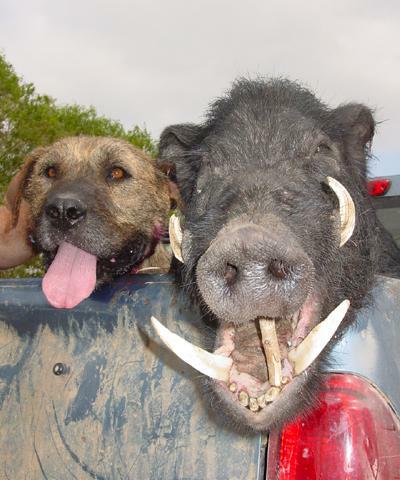 It certainly was not like chaseing the hog with a pickup. Running throught swamp, busting through thick brush and briars, the dogs baying, the hog getting lose a couple of times while you try to make sure you don't end up needing stitches, someone grabs the back legs while another slides in to end it as quickly as possible with a knife to the heart under the front leg. It seems more of a way to put meat on the table and control the distruction caused by the increasing population of wild hogs. I was amazed at the damage they do rooting around. There is no meat loss and no wounded animals getting away to die later. I'm not making a judgement one way or the other. It's an old tradition for some. A number will use the dogs to catch the hogs then bring them back to the farm to be corn feed for a time before butchering them like any other livestock. Hello I haven't posted here in a few yrs...things have changed a lot. I lost my windows program and was looking up the good Ole PointBlank program and found the new forum..nice. Anyway far as hogs go..I've caught them using dogs and we would load them in dog box if in truck or tie them and load in boat if using airboat. Always took them back alive and feed them out. Personally I didn't care much for it..too much work. I personally don't care to stick one either..I like shooting a meat hog every now and then with bow or gun. Welcome back to the forums Hoyt. Came across this website whilst looking for a hunting ute. Heaps of good info and a very good gallery of pics. The pedigree of the dogs they use is interesting. Don't think I would like to run fowl of any of these dogs....reckon they could be real nasty if they chose to. Here is a couple of the pics as a taste of whats in there. I'm going to try and make a few atlatls soon. I don't have any dogs. I just stalk the boars or ambush them. If any of you are going to try this, I need to tell you, it's not for the faint-hearted. I've had to have stitches several times from hogs that made a fight of it. Be ready to climb trees...real fast! But it's a great adventure! The Australian aborigine has been using a similar thing for thousands of years. They call it a woomera. You bet your boomerang I do! I never leave the house without at least 3 knives on me...all Cold Steel. When I hunt pigs, I always carry a Cold Steel Bushman knife on my belt. It's a great skinning knife, big enough to fight with, and it's all once piece of metal, so it's hard to break. It also holds a razor edge. I think the woomera is the same thing as an atlatl. They're great! Your in Australia, so maybe you can help me with a new project. I have several returning boomerangs, but I know that there are also non-returning boomerangs used for hunting. Is there anywhere online that sells them, or has instructions for building and using them? I'd like to try my hand at that next. Boomerangs...they are a bit of an enigma. There are a number of different types and unfortunately I know very little about them. When I was young, like all kids, I made a couple...some came back, some didn't (by the way...you know what they call a boomerang that doesn't come back.......a stick!). Good luck with your idea mate. That's exactly what I was looking for. I'm going to try and make one of the hunter/killer/combat styles and go after some small game, maybe some beavers. And I am not alone in this quest. There are many others who explore the ancient world as I do. The most famous were probably the crew of the ubiquitous Kon-Tiki, under the command of Thor Heyerdahl. So, if I seem a bit eccentric, it is only because of my desire to increase our understanding of what came before us. There are many people who spend time in the scrub, living off the land, practising the old methods. There are also quite a number of Survival Courses out there that teach exactly that....survival in the wild. I think that most feel that to do this is to become primitive, but I don't necessarily believe that this is the case. Even "primitive" man could live with a certain degree of comfort...shelter from the elements, fire for cooking and warmth, furs etc for clothing, hunting and foraging for food and water. So long as the basic needs are met then anything beyond that is comfort. I have to agree wholeheartedly with you Gigmaster when you say the best way to understand is to experience. Mere research and observation gives only theoretical knowledge...physically doing things gives practical knoledge and experience. This is true of pretty well everything in life. Good luck with your ventures mate, and be aware that there are people on this Forum who have the experience and knowledge to guide you if you are interested and ask. A "Wacko"?? No body called you a wacko...Vince...Did you call gigmaster a "Wacko"? Noboby called me whacko here, but the locals sometimes wonder about me, so I was just heading it off at the pass. One thing I have learned by doing all this is that primitive people weren't really all that primitive. An atlatl, for instance, actually has a lot of engineering to it. The energy is actually stored in the 'flex' of the dart, and they used stone weights to adjust the power of the throw, very much like tuning a compound bow nowadays. Did you know that the Penobscot Tribe in the Eastern US had a kind of compound bow with a fully adjustable draw weight? This was quite some time before the European Invasion.